In the fall of 1916, a red-haired, hazel-eyed girl boarded a steamboat in Lancaster County, Virginia, to embark upon an adventure of discovery. Helen Davenport's journey led her to the State Normal School for Women at Fredericksburg, where she enthusiastically explored music, history, and other activities that led to completion of a teaching certificate. Along with her trunk and high hopes for the future, Helen then caught a train headed to Richmond to accept a teaching job in Chesterfield County for $55 a month. She had to budget carefully - paying $20 a month for room, board, and use of a horse and buggy - but the move paid off as she continued her teaching career for the next 50 years. 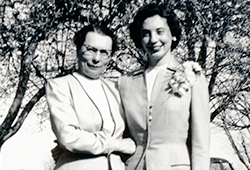 Recently, Helen's daughter, Joyce Lee Smith '58, arranged a generous bequest to the University of Mary Washington to create the Helen Davenport Smith 1919 Scholarship in History. While the name of the school has changed, Joyce says she is proud of the Mary Washington connection she and her mother share. "Mother was a great woman in her time. She came through two world wars, married, had a child, worked through the Great Depression, was widowed, and continued working to pay for her own daughter to go to Mary Washington," says Joyce. "Through it all, Mother never went in debt. It was lean goings at time, but we made it." Joyce's own journey was a bit more circuitous. She didn't plan to attend Mary Washington but, after visiting other possible sites, she reluctantly enrolled at her mother's alma mater. She majored in foods and nutrition and minored in biology. "I quickly came to love Mary Washington as much as my mother did," says Joyce. "It was one of the best times of my life, and I still stay in contact with many friends." Helen visited campus often, and Joyce fondly remembers the words her mother spoke in 1958 after Commencement in George Washington Hall. "She put her arms around me and said, 'I've given you this, now the rest is up to you,'" says Joyce. "I knew how hard she worked, and I valued what that sacrifice meant." After graduation, Joyce took a position in Richmond as a dietitian. Feeling her career advancement was stalled, she utilized her liberal arts background and biology minor to become a science teacher in Chesterfield County. "For a time, Mother and I even taught at the same school," says Joyce. Helen retired from teaching history in 1969 with 50 years of service; she passed away in 1993. Joyce taught for 31 years, 20 of which she also served as department chair at Midlothian High School. 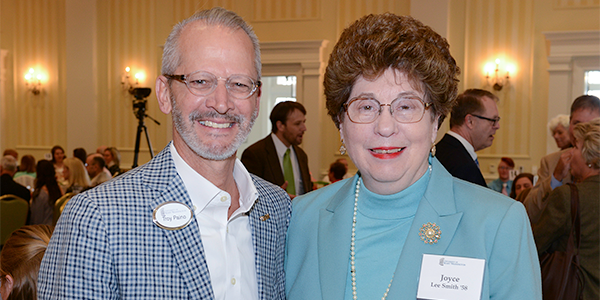 In April 2017, Joyce returned to Mary Washington to attend her first Donor Appreciation Lunch. As a member of the UMW Heritage Society, she visited with students, chatted with fellow alumni, and met President Paino. She says the whole experience confirmed her decision to continue her family legacy at Mary Washington. At the 2017 Donor Appreciation Luncheon, President Troy Palno thanks Joyce Lee Smith '58 for her commitment to Mary Washington. "I was looking for a way to honor Mother in a manner that connects the two of us," says Joyce. "It started at Mary Washington when she received her teaching certificate; and my Mary Washington degree and biology minor carried me through life. Now that I have completed my estate plans to create this scholarship, I feel that everything is just right." If you would like more information about bequests or scholarships, please contact the UMW Office of Gift Planning.